I’ve mentioned before that I have a real desire to make a connection with my family roots, particularly with the women and the culinary traditions they would have passed down to their daughters through the generations. Many of these were lost when my great grandparents moved to Canada many years ago, so I’m attempting to revive some of them with my children before they’re lost entirely. I was doing some research on wood stoves recently (I refuse to use our hopelessly inefficient 35 year old gas furnace and would love to get a wood stove to replace the space heaters we’re currently using), and spotted this old aebleskiver pan on Ebay for next to nothing. It’s made by Jotul, a Norwegian maker of beautiful cast iron wood stoves. After a good cleaning and reseasoning, it looked as good as new. 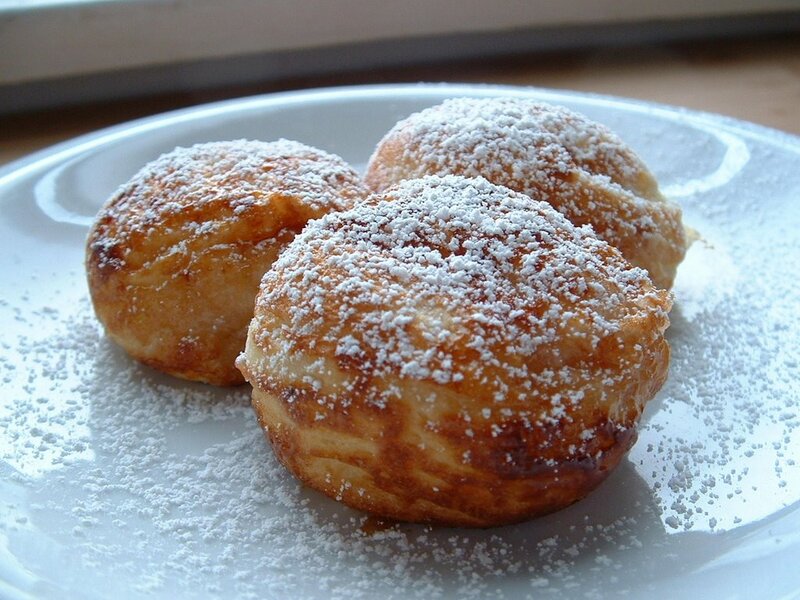 Aebleskiver are puffy Scandinavian pancakes that are often filled with jam or pieces of apple. The bottom of the cups are rounded, so when you flip the pancakes, you end up with little round “puff balls”. The recipe that I used (find it here) seems like a good one. I altered it by using 3 eggs instead of 2, and I substituted half yogurt/half milk for the buttermilk. Their taste and texture are similar to Yorkshire Pudding (eggy and soft) only slightly sweeter.I filled some of them with Peach Melba (peach/raspberry) jam while they were cooking, and left some plain so the kids could fill them with whatever they wanted. We tried maple syrup, honey, pear butter, and peach jam, all of which were delicious. They’d be amazing with whipped cream and raspberry jam (maybe Christmas morning! ).Aebleskiver make a yummy weekend breakfast, and are sure to be a hit no matter what your family’s background! Impressive! Both the cleaning up of the pan and the lovely looking aebleskiver. Cheryl, yesterday and today our library was having one of its 4 yearly used book sales. I really had a haul. Between gardening books and books about early US History for my husband, I found a haul of great cookbooks. Today I am using one of them to make bread. I’m making plain, good old-fashioned 100% whole wheat bread from The Laurel’s Kitchen Bread Book (First edition, 1984). I found a treasure trove of others as well. (Like I needed more!!) Happy Sunday. What a find! I’m jealous. My Krumkake iron was also made in Jotul so I know that the quality is superb. The Aebleskiver look delicious. Do you want to come cook for me? Wow, you gotta love library book sales. I love, love, love the Laurel’s Kitchen Bread Book (the oatmeal bread is one of my favorites)! Sounds like we should get together for a Norwegian brunch sometime! I’m in! Would be lots of fun. What a find. And the treats look super. So you didn’t have too much trouble reseasoning it? I have and old cast iron waffle maker that was also made for a woodstove, but every time I try to use it they stick like the dickens. Any suggestions? Burdock Boy – I would coat it with oil and leave it over low heat (or in the oven) for awhile (half hour to an hour). You might have to do this a few times. I never use soap when I wash my pans, and I put them on a warm element to dry them quickly (you can even wipe on a thin layer of oil before putting them away). Making sure that your iron is hot before adding the batter might help too. I hope that helps. Well seasoned cast iron is better than teflon! Cheryl, my sister in law has her mom’s old cast iron pan, 3rd generation use now. And it is truly better than any non-stick. It is black and shiny and just plain great! Your blog is a pleasure to read. PS – my wheat bread from Laurel’s Kitchen bread book is so yummy. I went to put an email link on my profile yesterday, but I can’t figure out how to keep it from displaying our whole name. I’ll see what I can do. Oh, try the raisin bread too, it’s fabulous! I have some well seasoned cast iron pans as I have given up teflon for awhile now, but this waffle iron is stubborn. I guess I’ll try oiling it a couple times before I use it again. Then perhaps I’ll make really oily or buttery waffles. I emailed my Danish friend to ask about aebleskiver. She said she does indeed make them and that the word means “pieces of apples” because in the old days you put pieces of apples in before you turned them over. She said she’d send me her recipe too. The things we can learn! Amazing! 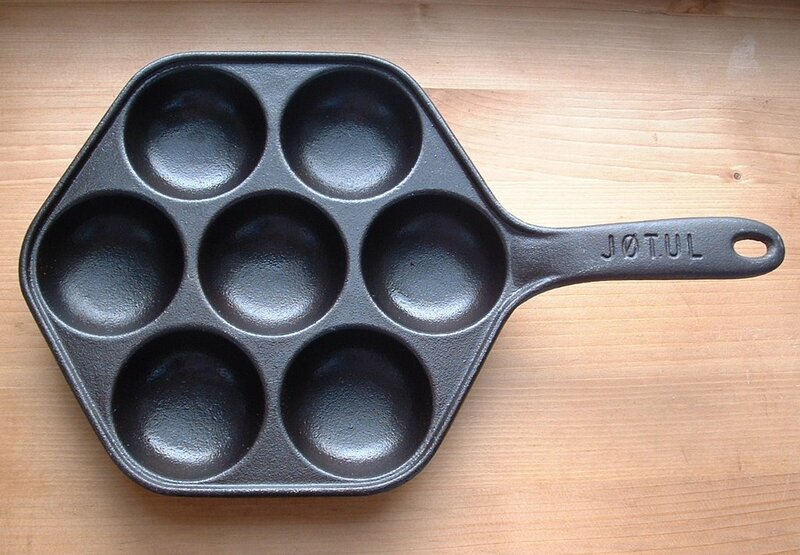 Thirty five years ago my Mom and I purchased an “Aebleskiver” pan made by Jotul. I thought it was a Dutch poffertjespan, but I was wrong. Never knew what to do with it, till now. 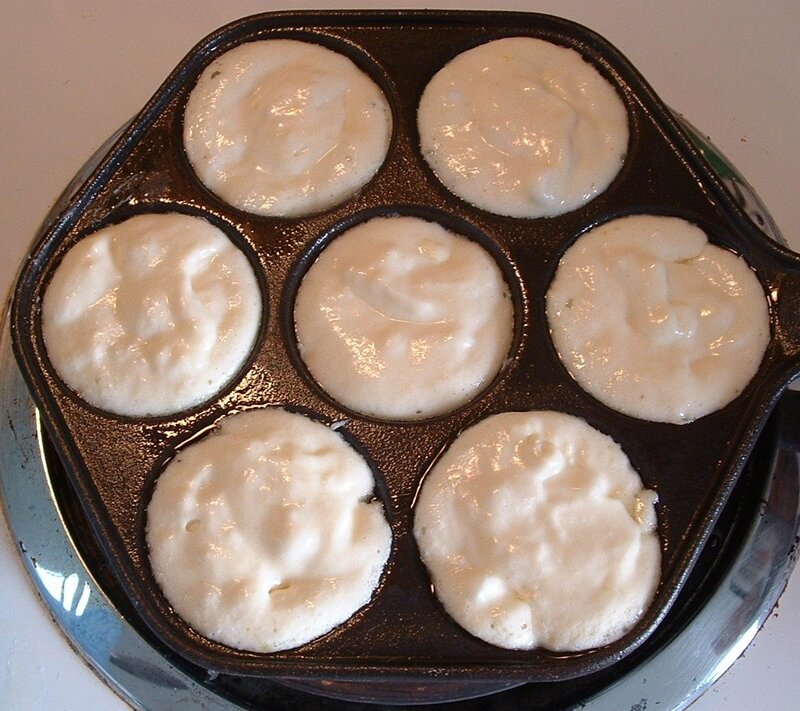 I am going to try to make these aebleskiver.